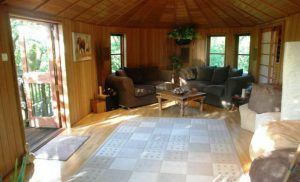 For anyone who has ever wondered if you could bring the adventure of a safari to a comfortable family home: Blue Forest presents the Safari Style Treehouse. An example of what is possible with a bit of imagination and a great outdoor space. 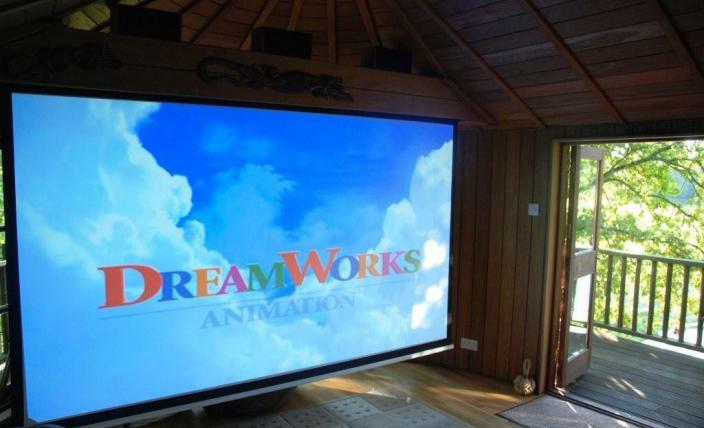 Meant to evoke the kind of lookout post that you might use when on safari, the treehouse has been adapted for the particular needs of this Surrey based client. 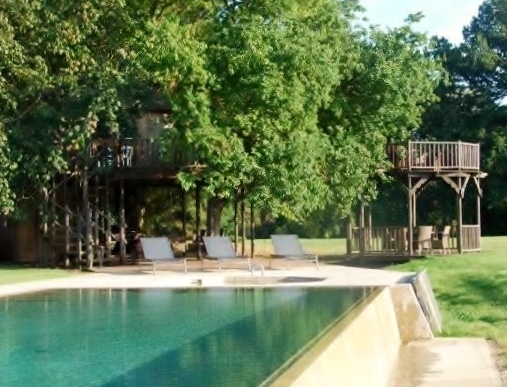 The Safari Style Treehouse surrounds a beautiful oak tree and with its adjacent swimming pool, is the ideal place to entertain and relax at any time of year. 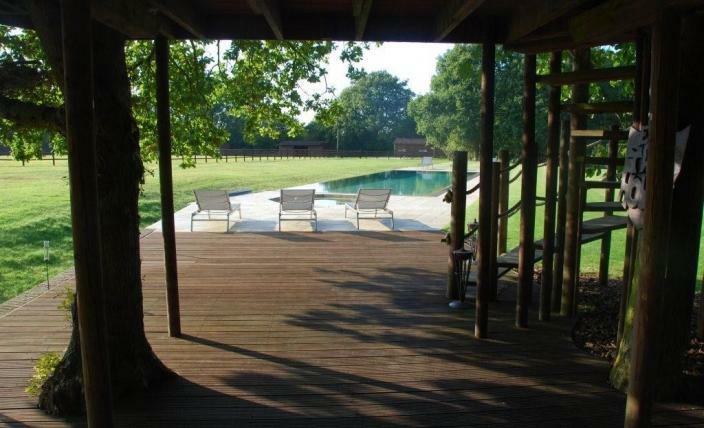 This luxury treehouse is finished to the highest specifications and even includes under floor heating. With spacious living room, kitchen, shower and toilet, the tree house creates a wonderful, exciting pool house. Access to the treehouse is via a short spiral staircase, starting next to the pool area and leading around to the front entrance of the house on the first floor decking. One of the most innovative and family-centric additions to the Safari Style Treehouse is the inclusion of a home cinema system with large screen, perfect for family movie nights or kid’s sleepovers once the sun goes down. 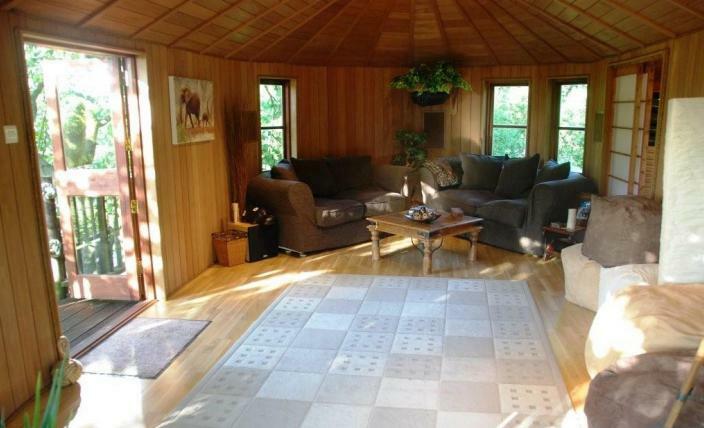 And for anyone looking for some down-time, the living room provides ample room to escape and relax. It is decorated with a soft rug and seating to suit every taste from armchairs and beanbags to big comfy cushions. Several tall, rectangular windows located around the room provide plenty of natural light and a set of large double doors open out on to the balcony to make the most of warmer weather. 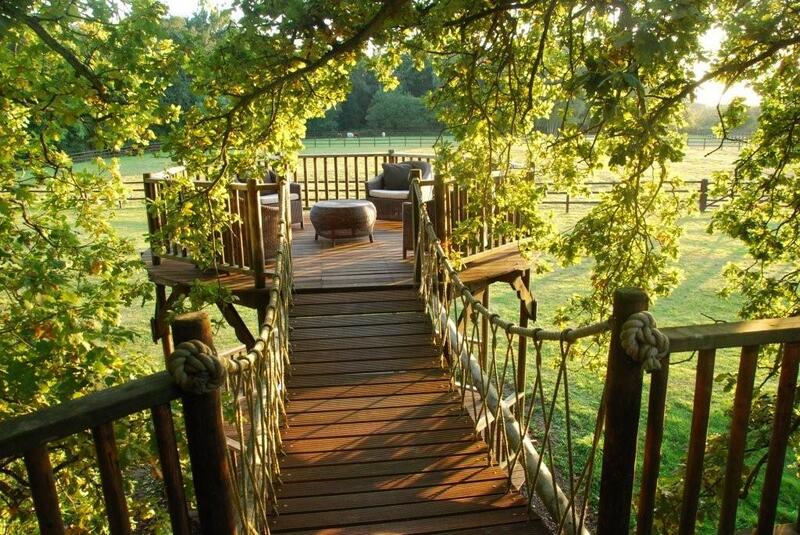 For reclining in the open air, the Safari Style Treehouse features an outside seating area located on a second platform connected by a short rope bridge walkway to the main tree house deck. This second platform emerges beyond the foliage that shades the main treehouse, inviting guests to look up at the stars at night and sunbathe in the day. And if it rains? Directly underneath the extended platform is a ground level deck, evocative of a bandstand and ideal for taking shelter from showers. 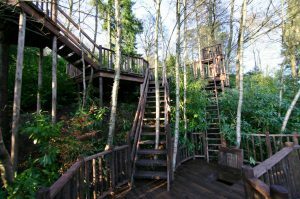 The Crazy Decks Tree House, created by Blue Forest, stands on top of a gentle hill, and creates an access from the top to the bottom of a garden. 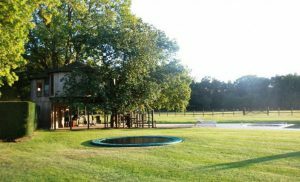 The tree house, starting point to the path, provides the owners with a wide view over the garden, and with a wonderfully adventurous playground for the children. 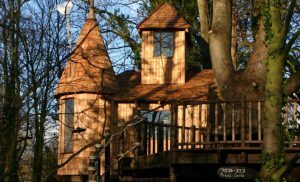 This two-storey enchanted forest tree house is built next to a small river in the woodland of the beautiful Hertfordshire countryside. The structure features a large room and open turret with a ladder leading up through a secret trap door into an upstairs hide away.